See HelpKidzLearn for free activities, software and resources from Inclusive Technology. 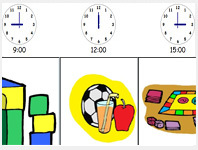 The site has many different sorts of games and activities for children with special needs along with hints and tips for parents, teachers and helpers. 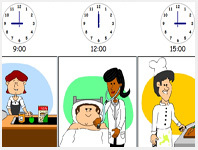 This simple software is ideal for sequencing any series of events, including what will happen during the working day. It may be especially useful for sequencing activities that are difficult to remember. You could even use it to show rewards or outcomes for successfully completing activities. Most commonly it is used as a visual reminder of tasks and activities. The program must be downloaded and installed on your computer before you can run it. We are based in a beautiful place! Delph is in the heart of Saddleworth, known for its dramatic Pennine moors, river valleys and picturesque villages with mills and stone built cottages. The photographs in our desktop calendar have all been taken around the Saddleworth area by local photographer John Todd. Now you can use them as computer wallpaper. We hope you enjoy them as much as we do - and don't forget to check back next month for the next installment! This collection of fun-filled printable activity overlays for communicators is designed to complement SwitchIt! Farm Extra software or any farm related activity. Used on voice output communication aids, the activities are designed to help increase participation, extend language skills, reinforce learning and enable expression of understanding. Simply print out the overlay that matches your communicator and record the messages on your device (suggested 'scripts' are also available). The overlays are available in Boardmaker and PDF formats. - Download 'Farm Scene' resources as a Boardmaker (23.8Mb) or PDF (133k) file. - Download 'Mother and Baby' resources as a Boardmaker (19.2Mb) or PDF (113k) file. - Download 'Old MacDonald' resources as a Boardmaker (2.7Mb) or PDF (55k) file. - Download 'Pig Story' resources as a Boardmaker (12.3Mb) or PDF (131k) file. - Download 'Pig Story Vocab' resources as a Boardmaker (17.4Mb) or PDF (116k) file. - Download 'What Am I' resources as a Boardmaker (21.1Mb) or PDF (80k) file. - Download 'Animal Noises' resources as a Boardmaker (18.6Mb) or PDF (96k) file. - Download 'Game Overlay' resources as a Boardmaker (10.7Mb) or PDF (89k) file. - Download 'Mother and Baby' resources as a Boardmaker (19.2Mb) or PDF (100k) file. - Download 'Old MacDonald' resources as a Boardmaker (8.3Mb) or PDF (81k) file. - Download 'Pig Story' resources as a Boardmaker (7.9Mb) or PDF (76k) file. - Download 'Pig Story Vocab' resources as a Boardmaker (17.4Mb) or PDF (104k) file. - Download 'What Am I' resources as a Boardmaker (10.4Mb) or PDF (69k) file. - Download 'Animal Names' resources as a Boardmaker (10.4Mb) or PDF (91k) file. - Download 'Animal Noises' resources as a Boardmaker (10.6Mb) or PDF (88k) file. - Download 'Mother and Baby (a)' resources as a Boardmaker (10.4Mb) or PDF (107k) file. - Download 'Mother and Baby (b)' resources as a Boardmaker (8.7Mb) or PDF (89k) file. - Download 'Old MacDonald (a)' resources as a Boardmaker (3.0Mb) or PDF (81k) file. - Download 'Old MacDonald (b)' resources as a Boardmaker (3.0Mb) or PDF (91k) file. - Download 'Old MacDonald (c)' resources as a Boardmaker (3.0Mb) or PDF (83k) file. - Download 'Pig Story' resources as a Boardmaker (7.9Mb) or PDF (142k) file. - Download 'Pig Story Vocab' resources as a Boardmaker (4.0Mb) or PDF (95k) file. - Download 'What Am I (a)' resources as a Boardmaker (5.2Mb) or PDF (79k) file. - Download 'What Am I (b)' resources as a Boardmaker (5.2Mb) or PDF (72k) file. - Download 'Animal Noises' resources as a Boardmaker (10.7Mb) or PDF (137k) file. - Download 'Mother and Baby' resources as a Boardmaker (19.2Mb) or PDF (144k) file. - Download 'Old MacDonald' resources as a Boardmaker (8.3Mb) or PDF (120k) file. - Download 'Pig Story' resources as a Boardmaker (7.9Mb) or PDF (112k) file. - Download 'Pig Story Vocab' resources as a Boardmaker (17.4Mb) or PDF (154k) file. - Download 'What Am I' resources as a Boardmaker (10.4Mb) or PDF (90k) file. - Download 'Animal Noises' resources as a Boardmaker (10.7Mb) or PDF (145k) file. - Download 'Mother and Baby' resources as a Boardmaker (19.2Mb) or PDF (142k) file. - Download 'Old MacDonald' resources as a Boardmaker (8.3Mb) or PDF (128k) file. - Download 'Pig Story' resources as a Boardmaker (12.3Mb) or PDF (188k) file. - Download 'Pig Story Vocab' resources as a Boardmaker (17.4Mb) or PDF (157k) file. - Download 'What Am I' resources as a Boardmaker (10.4Mb) or PDF (110k) file. - Download 'Animal Noises' resources as a Boardmaker (10.7Mb) or PDF (97k) file. - Download 'Mother and Baby' resources as a Boardmaker (19.2Mb) or PDF (106k) file. - Download 'Old MacDonald' resources as a Boardmaker (8.3Mb) or PDF (94k) file. - Download 'Pig Story' resources as a Boardmaker (12.3Mb) or PDF (134k) file. - Download 'Pig Story Vocab' resources as a Boardmaker (17.4Mb) or PDF (118k) file. - Download 'What Am I' resources as a Boardmaker (10.4Mb) or PDF (88k) file. - Download 'Animal Noises' resources as a Boardmaker (41.6Mb) or PDF (150k) file. - Download 'Mother and Baby' resources as a Boardmaker (19.3Mb) or PDF (151k) file. - Download 'Old MacDonald' resources as a Boardmaker (13.4Mb) or PDF (132k) file. - Download 'Pig Story' resources as a Boardmaker (12.3Mb) or PDF (196k) file. - Download 'Pig Story Vocab' resources as a Boardmaker (30.9Mb) or PDF (163k) file. - Download 'What Am I' resources as a Boardmaker (10.4Mb) or PDF (114k) file. A collection of early learning musical activities, ideal for Key Stage 1. Free Play - Play the on-screen keyboard. Record and play back a sequence of notes. Choose a new voice to play back the same sequence. Record a sequence for someone else to copy. Play the same note - A note is played - play the same note. Turn on a visual clue. Hide the keys entirely whilst the note is played. Experiment with different voices. Play a higher note - A note is played - play a note that sounds higher. Turn on a visual clue. Hide the keys entirely whilst the note is played. Experiment with different voices. Although you can just keep hitting the top or bottom note on the keyboard as appropriate, there is the freedom for the teacher to say 'play one note higher', or 'see how close you can get to the note that is being played. How many notes? - A random sequence of notes is played. How many are played? Choose sequences between 1 and 3 notes or 4 and 7 notes. Choose whether the notes are spread over the whole keyboard or just the first 5 notes. Choose how long a pause is played between each note. How does it sound? - Open ended. Play one of 15 sounds by clicking on a picture. 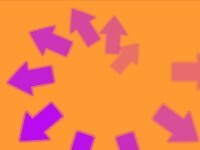 Use the arrows to go to another sound. Click on the words to describe the sound. Type in your own words and print the screen. How might it represent that sound? What other ways could you represent the sound in a picture? You can set targets at different levels, to gradually improve an individual's listening skills in a fun way. Use a mouse, keyboard, touch monitor, or IntelliKeys. Another free, switch accessible program from Inclusive Technology. One or two switch scanning, mouse or touchscreen and keyboard shortcuts. Save the sound file to disc. Set an automatic recording time out. 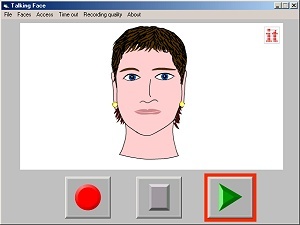 Download Talking Faces - 3.3Mb. Download help file as Word (23k) or RTF (10k). "SENSwitcher is a suite of programs designed to help teach early ICT skills to people with profound and multiple learning difficulties, those who need to develop skills with assistive input devices and very young children new to computers. It is, we believe the first time anyone anywhere has developed an online switch enabled application which targets ICT skills from purely experiential through cause and effect, switch building, timed activation, targeting and row scanning." "Programmed by Inclusive Technology, a world leading developer of software for special needs, it uses the latest Macromedia Flash technology to deliver 132 high quality animated activities which can be operated by a wide range of input devices. SENSwitcher has been designed as a progressive teaching and assessment tool and is accompanied by an 18 page set of teachers notes together with assessment records, developmental skills progression models and small step checklists linked to the QCA P Levels for ICT. These documents are available FREE from the download area (of the Northern Grid web site)." "The program is available FREE to teachers, parents, care workers, if fact anyone who wants to use it. We hope you and your children enjoy it." A free, switch accessible CD player for Windows 95 onwards. Download instructions as Word file (28 k) or RTF file (9 k). An updated file containing all the equations for these two programs. Without this updated file, some of the equations may be incorrect. C:\Program Files\MathsWiz - Level 1\Matteknep.ovn. By replacing the original Matteknep.ovn file with this new one, the errors should automatically be corrected in the game. import graphics in a wider variety of formats: JPG, TIFF and PNG, as well as BMP and WMF. A stand-alone serial switch driver for Windows, programmed to send the standard keys of Space and Return. For single or two switch access. Option to send a continuous stream of keypresses or a single keypress. Send a selection of other commonly used keypresses such as function keys and number keys. A fix for the 'Read the Digital Time' activity. Without this update, not responding within this activity for about two minutes would crash the program. Updated version of Overlay Sender for Windows, now compatible with Windows NT, Windows 3.1, Windows 95/98. NT users: IntelliTools no longer support NT, but this download may work on some NT systems. Free pictures from some Inclusive Technology software. The pictures can be saved individually, or downloaded as collections in ZIP files. Pictures from SwitchIt! Scenes - (program available for Windows and Mac). Pictures from My World - Animal Matching and My World - Animal Sorting (programs available for Windows and Acorn). 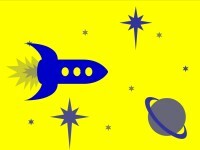 Pictures from Living and Growing - Science KS1 (program available for Windows and Mac). Pictures from Spider and friends! - Easy Maths (program available on CD-ROM for Windows and Mac). The ACE Centre offers high quality, comprehensive CPD for anyone working with people with complex communication needs and/or physical difficulties. There is an emphasis on work based practice will encourage you to develop your knowledge and enhance your working practices. Accredited courses - combine distance learning with attendance at four day sessions. Manchester Metropolitan University accredited. 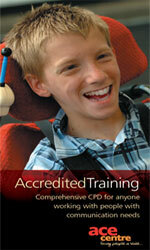 One day courses - for understanding and using assistive communication technology.